The Sew Knit Create Shop: Megan Nielsen Banksia Top Sew a Long and SALE!! Megan Nielsen has announced the schedule for the Sew a Long she is hosting for The Banksia Blouse. Following a Sew a Long is a great way to get a helping hand if you are a fairly new sewer or just want some extra tips. 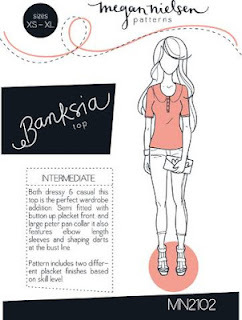 Megan will be covering pattern alterations and showing you how to alter the pattern to make a Banksia Dress and also how to make a Banksia T-shirt.